Superman III is barely a Superman film. Yes, the character of Superman is there. He even goes back to Smallville. However, Superman III is really a Richard Pryor film with Superman as a guest star. Now, I love Richard Pryor as much as anyone: he truly was a comedic genius. However, when one sees Superman III one thinks it should have been retitled Richard Pryor Meets Superman. In fact, this film should have been rethought entirely. Gus Gorman (Pryor) just cannot find a job no matter how inept he is. Stumbling into computer programming, Gus discovers to his shock that he's a natural with machines. Figuring that he just isn't paid enough, he skims a little off the top to get a quick raise. This $85,000 bonus does not go unnoticed by his boss, Ross Webster (Robert Vaughn). Webster sees a kindred spirit in the bumbling Gorman (at least in the criminal aspects), and with a little 'friendly persuasion' (aka blackmail) he gets Gorman to perform certain criminal acts via computers (he was a hacker before the term existed). For example, he gets Gorman to reprogram a Vulcan satellite in space to bring weather chaos to Columbia (which has rebuffed his offers to corner the coffee market). Along with Webster's sister Vera (Annie Ross) and blond bimbo mistress Lorelei (Pamela Stephenson), Ross suspects he now can rule the world by taking over the oil industry. Meanwhile, in another movie altogether, mild-mannered Daily Planet reporter Clark Kent (Christopher Reeve) persuades his editor Perry White (Jackie Cooper) to let him go to Smallville for his high school reunion and cover it for the newspaper. He also persuades White to have eager young photographer Jimmy Olsen (Marc McClure) to go with him. Lois Lane (Margot Kidder) is off to Bermuda, so she's literally out of the picture. On their way to Smallville, Superman stops a chemical plant fire (which costs Jimmy a broken leg and camera when he goes in to photograph it). At the Smallville High School Class of 1965 Reunion (which would make Kent either 28 or more believable at least 38 years old), he sees Lana Lang (Annette O'Toole), the girl he once had a crush on. Lang, now divorced with a young son, Ricky (Paul Kaethler), soon sees Clark in a new light, and a gentle romance starts to bloom. There is only one hitch: ex-Smallville High football star Brad (Gavin O'Herlihy) who still pursues Lana and was Kent's bully. After fits and starts the two stories finally meet. Superman's intervention with the Columbia operation infuriates Webster, and he comes up with the idea of creating Kryptonite. Gorman cannot figure out an unknown element in the formula, so he opts to stick tar in it. At an event honoring Superman, Gorman and Vera presented him with the created Kryptonite. It doesn't kill him, but it turns him into a dark, evil man. After a literal struggle with himself Superman emerges from his dark night of the soul and is ready to confront Webster/Vera/Lorelei and Gorman, who has pushed his boss to create a super-computer. Richard Lester, returning for a second Superman film, figured that what Superman III needed was more comedy. As such, we start Superman III not with the Man of Steel, but with the real main character: Gus Gorman, with a comedy bit that shows Pryor's verbal abilities. I don't know if anyone has actually timed the screen-time between Reeves and Pryor, but I'm willing to wager that Richard Pryor has more screen-time than the title character. Minus the battle between Superman and Clark Kent (more on that in a bit), there are few scenes that focus on Superman alone. There are however, many scenes and comedy bits that feature Pryor's Gorman and his bumbling efforts to please his employer. Again, this isn't to take away from Richard Pryor and his extraordinary comedic gifts, but the emphasis on Gorman reduced Superman's role to where he was almost irrelevant to the film save for being the title character. In fact, if one were to remove Superman from Superman III and restructure it as a solo Richard Pryor film, one could easily have made a whole film out of the Gus Gorman character with little difficulty. I'm not saying that Gus Gorman: The Movie would be good, just that it would be possible. In this perhaps we have one of the main reasons why Superman III is such a failure: it takes such a long time for the two stories to come together that by the time they do, it seems like they don't fully fit. Moving on to the actual physical comedy that at times overwhelms Superman III, one can only look at it with a certain dismay that once the Superman franchise was seen as an action series. The title sequence is one long slapstick comedy routine that never looks convincing (it actually looks boring and forced) and makes the horrific comedy bits in what was suppose to be an epic confrontation in Superman II look like an Ingmar Bergman exercise in restraint. It adds nothing to the plot, it isn't funny, and it is a waste of our time. 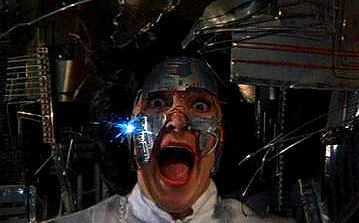 Even worse was a notorious scene in Superman III. The villains are in the ski ramp up in the penthouse of a tall building. For no real reason, as Webster rants and raves and hatches plans to kill Superman, Gorman slips on a pair of skis. Already this was a bad scene when Gorman comes to tell them that Superman has interfered with their Colombian coffee caper (one didn't know Superman is in with Juan Valdez), which commits a major no-no in film: it shows AND tells what is going on. As part of his reenactment of Supe's saving of Columbia he uses a tablecloth as a cape. So when Gorman starts sliding down the ski ramp, we find that he doesn't know how to ski and quickly loses control, flying off the roof. He then falls thousands of feet high, only to land first in a slanted part of the building, which causes him to land safely onto the street. Already this was a bad scene, but to have Gorman fly off the building to land so nicely on the street is really insulting to the audience. Gorman's knees don't buckle, he doesn't break anything. It turns Superman into a farce, a joke we can't laugh at. It was worse than unfunny...it was stupid. In fact, so much of David and Leslie Newman's script is stupid and insulting that it shows that left to their own devices they were more than willing to make things into jokes rather than take things with a certain seriousness. The ski incident, Gorman managing to get Brad drunk to use the Vulcan satellite (which led to 'accidental' situations like a man getting more cash from an ATM and crosswalking figures actually fighting--talk about stupid), his grandstanding at the grandstand...when Webster declares that they might not know who had bilked the company "unless he were a complete and utter moron" we know that we'll get confirmation that the culprit IS a complete and utter moron. Even the parts that were meant to be serious, the moments when Lester and the Newmans weren't going for laughs, with one or two exceptions failed spectacularly. When Superman, for example, finds the Webster lair, Ross attempts to shoot him down with help from a screen that not only looks like it was taken from a video game, but which also has the points and music of one as well. In what is suppose to be a shocking moment, Vera has been overtaken by Gorman's super-computer and been turned into a Cyberman if you will (a little Doctor Who reference for you). When she finally emerges her figure does nothing except move Lorelei and Ross out of the way. Her stiff robotic walking coupled with Ken Thorne's score makes the thing unintentionally hilarious (as his the music being so dramatic when Supe is straightening the Tower of Pisa). Granted, when I first saw it as a kid it was quite shocking, but now it looks and sounds funny. The script also has points of logic that don't make any sense. Scientists are baffled by the chaotic Colombian weather we are told, but I thought that was stupid. Didn't ANYONE note the use of Vulcan? We're suppose to believe Superman has gone to the Dark Side, turned evil (and I have to wonder, does tar really have that much effect on someone because I once did construction, so now because I got some tar on my hands once I'm going to go on some crime spree?). Now, what are these evil acts? He straightens the Tower of Pisa and blows out the Olympic flame (which in itself is really odd since the Olympic Games would have taken place in 1988...it's not making any sense). This is Superman, who can bend rivers and move mountains. You'd think if he really did turn evil he would have done much more than blow out a candle and straighten something up. I know they couldn't because then it would ask a lot of questions we would never answer, but it does add to this bizarre attempt at humor when it isn't necessary. I don't fault the cast for the parts: people like Vaughn and Ross and Stephenson played the parts correctly (slightly evil villain, mannish bossy sister, dumb blond who really was much smarter but for reasons known only to her pretended otherwise), but they as a trio never appeared to be much of a threat to anyone, let alone the Man of Steel. There are only two good things in Superman III apart from Pryor's comedic skills. The first was the subplot in Smallville, particularly Annette O'Toole's performance as Lana Lang. She appeared to be the only one in the cast to be acting as if she were in a serious film, not a spoof or parody that Superman III apparently was trying to be. Her scenes with Reeve at the reunion dance or on a picnic show a tender and romantic quality to the Lang/Kent relationship that I don't think were fully explored in the Superman mythos (even perhaps on something like Smallville where Lana WAS a major character). 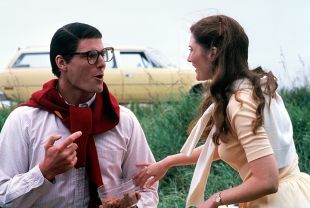 It's an interesting idea: Lana Lang, the small-town girl, is falling in love with Clark Kent while big-city lady Lois Lane is head-over-heels for Superman. The duality of the romances between Kent and Kal-El would be fascinating to explore, but of course that would mean taking time away from Gus Gorman. O'Toole was the standout in the film, where the romance between Lana and Clark appeared real and natural and most importantly, believable. I also grant that seeing Christopher Reeve explore potential dark roads for his character made for a deeper performance than the clean-cut hero we've seen before. Now, I will also say that the actual confrontation between Clark Kent and Superman where he literally struggles with himself is at least for me one of the oddest moments in film history, almost Dada-esque in its bizarre nature. Mostly silent, we have to accept that he is able to divide himself and have a physical alteration with himself. I found the whole sequence both weird and overtly symbolic, but despite the bizarre nature of the fight itself it was nice to see Reeve work to give Superman a stronger and darker persona. Side note: I noticed that the Super-Computer had the words "Exterior Defence" on the mainframe. I figure the computer was manufactured in the United Kingdom...or was that the movie? In the course of time, the affection I had for Superman III has dissipated. When once as a child I loved Superman III, as an adult I almost immediately saw it for what it was: a very bad film that tried too hard to tailor things to Pryor's talents than to Superman's, and minus the Smallville plotline, Superman III is not even a shadow of the glory that was Superman the Movie. During the movie, Little Ricky (and yes, he IS referred to as such in one point, making it all the more funnier) calls out to the drunk and angry Superman, "You're in a slump. You'll be great again." That pretty much sums up the film. In the end, the poster for Superman III describes the film better than I could: The Man of Steel is supporting the true star of the film, with everyone and everything else almost an afterthought, lost in a barren and empty space.